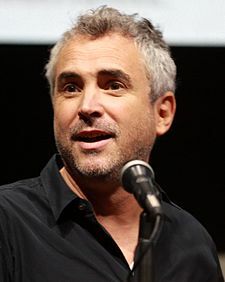 Alfonso Cuarón Orozco (born 28 November, 1961 in Mexico City, Mexico) is a Mexican film director. He directed the third Harry Potter film in the successful Harry Potter series, Harry Potter and the Prisoner of Azkaban. Prior to directing the series, he had not read any of the books within the series and did not consider the idea of doing a "big special effects film" to be on his radar. Cuarón made a great many changes to the Harry Potter film series, all of which were met with either great acclaim or stiff opposition by Harry Potter fans. Many caused serious continuity errors in relation to the previous two films, which were directed by Chris Columbus. These include Cuarón's changing the appearance and layout of Hogwarts Castle, by adding the Clock Tower, the Central Tower and changing the location of Hagrid's Hut. He also changed the appearance of Filius Flitwick and the appearance of all wands in the films. Most of these changes were accepted by the two future directors. When he was first signed on, he asked Emma Watson, Daniel Radcliffe and Rupert Grint to write a short essay on their characters. True to their characters, Emma turned in a 16 page essay, Daniel a one-page essay, and Rupert never turned his in! Alfonso Cuarón grew up in Mexico City and went on to study both filmmaking and philosophy at the National Autonomous University of Mexico. After graduating, Cuarón began working in television in Mexico, first as a technician and then as a director. Cuarón's television work led to assignments as an assistant director for several Latin American film productions (including Gaby: A True Story and Romero), and in 1991, he landed his first big-screen directorial assignment. Solo con tu pareja was a dark comedy about a womanising businessman who learns he's contracted AIDS; the film was a massive hit in Mexico, and was enthusiastically received around the world. Director Sydney Pollack was impressed enough with Solo con tu pareja that he hired Cuarón to direct an episode of Fallen Angels, a series of neo-noir stories produced for the Showtime premium cable network in 1993; other directors who worked on the series included Steven Soderbergh, Jonathan Kaplan, Peter Bogdanovich and Tom Hanks. In 1995, Cuarón released his first feature film produced in the United States, A Little Princess, an adaptation of Frances Hodgson Burnett's classic novel. Cuarón's next feature was also a literary adaptation, a modernized version of Charles Dickens' Great Expectations starring Ethan Hawke, Gwyneth Paltrow, and Robert De Niro. Cuarón's next project found him making a severe left turn; shot in Mexico with a Spanish-speaking cast, Y tu mamá también was a funny, provocative, and controversial road comedy about two sexually obsessed teenagers who take an extended road trip with an attractive woman in her thirties. The film's open portrayal of sexuality and frequent rude humour, as well as the politically and socially relevant asides, made the film an international hit and a major success with critics. He also directed Children of Men, a film which was nominated at the Academy Awards for Best Cinematography. Cuarón portrayed a wizard in The Three Broomsticks with candles in hand in Harry Potter and the Prisoner of Azkaban. In 2013, he directed George Clooney and Sandra Bullock in the drama Gravity. The film earned critical acclaim, with Cuarón taking home BAFTA, Golden Globe, and Academy Awards for Best Director, and sharing the Oscar for Best Film Editing. Alfonso declined the offer to direct Harry Potter and the Goblet of Fire because he would not finished working on the third film in time to begin the fourth. This page was last edited on 25 June 2015, at 18:50. This text is available under the GNU FDL and may have been adapted from the Wikipedia article about Alfonso Cuarón (history).